Ministry of Finance MOF has been published a new job circular for the Bangladeshi people, who are interested to join in Ministry of Finance MOF. Most of the students are taking themselves for doing a job in the Government Sector in Bangladesh. Ministry of Finance is doing a great work for our country. They are now enlightening our country around the world. If you give a better performance in MOF Job Circular 2019, you have big opportunities to join other big job and projects. If you want to apply for this job, you need some requirements to apply for this process. 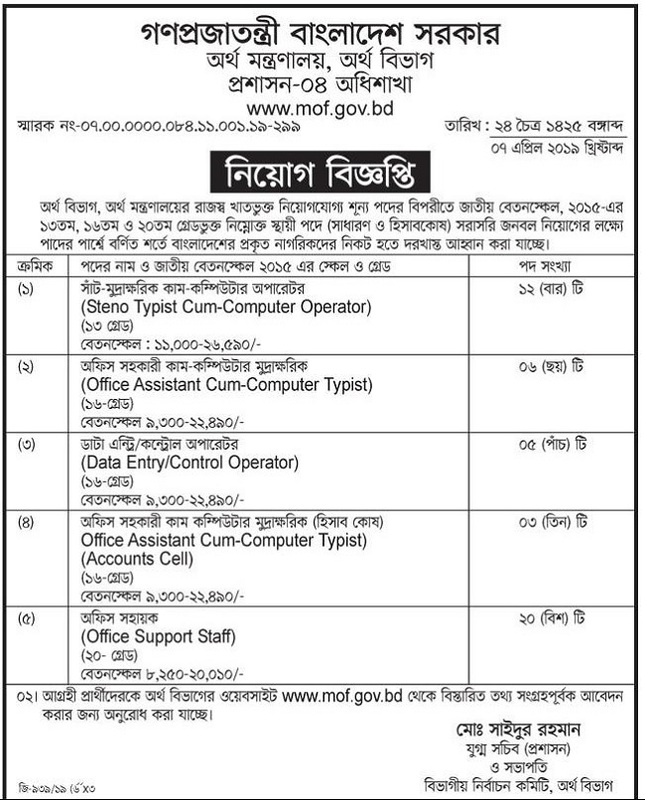 In this post, we will share with you all the process to Apply in “Ministry of Finance MOF Job Circular 2019”. We have attached the circular in below images. You can easily find the images below. You can find the fundamental information below. Please ensure that you have realized about this Job circular. If you face any problem to apply for this job, please let us know immediately. You will try to help you as soon as possible. You must need to know the apply process of Ministry of Finance MOF Job Circular. You must follow the instruction enlisted below. You must be qualified all candidates with Educational Qualification, National ID Card or Birth Certificate, Age, Experience and so on. After visiting this website you will see the Apply Now button, Just click on the button and be prepared for application process. Please bring the Scan copy of your Recent Picture and Signature before applying. Before submitting the Job Application form please check all the information correctly.